Electrical problems are one of the most common problems in old cars, ranging from small annoying items like windshield wipers that seem to have a mind of their own to major problems like ignition coils that won’t ignite, or fuel pumps that can’t put out. They are also one of the most expensive repairs you can pay for, since most of the bill will be spent in diagnosis. The automotive electrical system in my opinion is the most important support system of a modern car or truck. Imagine your own personal vehicle without an electrical system. The gasoline engine would not run. Electricity provides the needed spark for combustion, plus the power needed for starting. It is a necessity that your electrical system be running in top shape. If you feel that your car is lagging, give us a call to have a look. Automotive electronics is a reference to computer control modules and other black box type items used to control engine operation as well as vehicle systems such as instrument clusters. 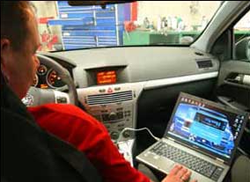 An electrical problem in a car stems from the nature of electrical circuits. An electrical device in a car must be part of an electrical circuit capable of providing the required voltage and current. If this is not the case, or if the device is defective, it will fail to operate as expected.